U.N. Secretary-General Kofi Annan met Prime Minister Ehud Olmert on Wednesday to discuss the deployment of U.N. troops to Lebanon and urge Israel to lift its six-week air and sea blockade of the country. Annan, in Jerusalem after visiting Lebanon, is trying to strengthen a two-week-old truce that ended a 34-day war between Israel and Lebanon's Hizbollah guerrilla group. On Tuesday, Annan said he hoped soon to double to 5,000 the number of U.N. troops in southern Lebanon and urged Israel and Hizbollah to end swiftly disputes blocking a lasting ceasefire. "We should all work together to ensure that this time the fragile peace that we are solidifying in Lebanon is for good and that we are not going to see another escalation," Annan said after talks with Israeli Defense Minister Amir Peretz. "My hopes are that with the French deployment moving forward and with the Italians beginning on Friday, that we should be able to double relatively quickly the 2,500 men we have on the ground and move up to 5,000 so that the Israelis can withdraw." Peretz said Israel would pull out thousands of troops that remain in southern Lebanon once a "reasonable" number of U.N. soldiers had deployed but did not give a figure. U.N. Security Council Resolution 1701, which ushered in the truce, calls for deployment of 15,000 peacekeepers by November 4. Annan, who met Olmert at his official residence, will also hold talks with Israeli Deputy Prime Minister Shimon Peres and Foreign Minister Tzipi Livni before traveling to the West Bank to meet Palestinian President Mahmoud Abbas. 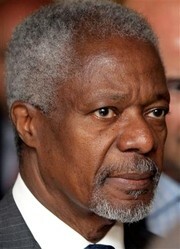 Aides to Annan have said he will also travel to Syria and Iran, Hizbollah's main backers, later in the week. Israel has refused to lift the blockade on Lebanon, saying U.N. troops must first deploy along the Lebanese frontier with Syria to prevent Hizbollah rearming. Hizbollah's capture of two Israeli soldiers in a cross-border raid on July 12 sparked the war. Annan said the Lebanese saw the blockade as a "humiliation and infringement of their sovereignty." But he also urged Beirut to exert control over its borders to stop arms smuggling. "I will also discuss ... with the (Israeli) prime minister the need to lift that blockade as soon as possible in order to allow Lebanon to go on with normal commercial activities and also rebuild its economy," he said. On a visit to devastated southern Lebanon on Tuesday, Annan said "serious irritants" to the truce were also the fate of the abducted soldiers and that of Lebanese prisoners held in Israel. U.S. civil rights leader Jesse Jackson, on a visit to the region to try to mediate a prisoner exchange, told Israeli Army Radio he had been informed by a Hizbollah leader that the two soldiers seized by the guerrilla group were alive. He said that during a visit to Damascus on Monday, "a Hamas leader told me ... that the Israeli soldier captured by Hamas is alive." Palestinian militants abducted Corporal Gilad Shalit in a cross-border raid from Gaza in June. Italy's first contingent of 800 troops, out of an eventual 3,000 pledged, set sail on Tuesday on what Rome said would be a "long and risky" mission. The aircraft carrier Garibaldi and four other naval ships were due to reach Lebanon by Friday. France promised to send a 900-strong battalion before the middle of September, with a second battalion to follow. The United Nations hopes to create a buffer zone in south Lebanon free of Israeli or Hizbollah forces and policed by the expanded U.N. force alongside some 15,000 Lebanese troops. It is hoping Muslim nations will send troops to balance the 7,000 or so pledged by European countries. The Turkish government said it wanted parliament to meet on September 5 to approve a troop contribution to the U.N. force, after agreeing in principle to send soldiers. Other potential Muslim contributors include Indonesia, Malaysia and Bangladesh, although Israel has objected to their taking part because they have no diplomatic ties with the Jewish state. Annan is likely to press Olmert on allowing such countries to contribute and U.N. sources have said the Israeli prime minister might be flexible. The war cost the lives of nearly 1,200 people in Lebanon, mainly civilians, and 157 Israelis, mostly soldiers. The truce on Israel's northern border is generally holding, but violence has continued in the Palestinian territories.